If you’re in the Humber area (or if you’re not and you don’t mind a bit of travel) there’s a splendid developer event happening here at the start of March. The Developer Developer Developer (DDD) North conference has a whole bunch of wonderful sessions and a fantastic venue (The University of Hull). I’m giving a session too, all about Air Quality and Azure Functions. It’s going to be fun, I’m really looking forward to it, and you should too. You can register here. It’s free. Today I had to get up early to catch a non-existent train. Of course, I didn't know it was non-existent as I got showered and hurried down my breakfast before dashing out of the house. I found out at the station. Apparently my train to Manchester was cancelled because it was "late leaving the depot". Which makes it sounded like they were trying to blame the engine itself. Anyhoo, after a brief panic I caught an earlier train that arrived later and made it to Manchester in time for my session. Which was great fun. I was talking about "Machine Learning", which is the tool that you use when you don't know how to solve the problem. As I said during the talk, there was a time when the thinking was that when we can get computers to play chess, we'll have cracked artificial intelligence. This turned out to be wrong. In fact, things that are hard for people (play chess, do sums very quickly etc etc) are comparatively easy for a computer but things that are easy for a human (get meaning out of conversation, walk down a busy street etc etc) are very hard for the machine. However, this is changing. Computers can do difficult things now. And you can build these behaviours into your applications. I showed off some software that recognised emotion, and another system that could tell stick figures from fish, and all using C# and running in my lowly Surface Pro 3. If you want to have a go at this, and find out more about Machine Learning (and you should) take a look at the labs pages for the tour which are here. Thanks so much to Microsoft for putting the tour together and Pete for making it work in Manchester. It was great fun and the audience were lovely. And, to make the day even better, my train back actually existed. Scott Guthrie is one of my heroes. Proper developer chops and the ability to deliver a really good presentation. I've seen him speak a couple of times and event had the pleasure to present at TechDays in the session before his. So I guess you could say I was once his warm-up man. Anyhoo, he's speaking in the UK on a couple of dates in early June. Once in London and once in Reading. I'm not going to be able to make it unfortunately, what with examinerish type things happening around then, but if you get the chance you really should go. If you fancy some cracking free training next week you can sign up for TechDays Online. There are a whole bunch of splendid sessions from Microsoft folks like Mike Tautlty and Paul Foster, along with some really good MVP speakers too. It runs over Wednesday 18th May and Thursday 19th. The whole agenda looks really interesting, but yo you can pick and choose what you watch.. You can sign up here. If you do go along, tell them Rob sent you. And mention cheese. We had our third Careers and Networking Event today. We had six companies presenting and it was standing room only in the lecture theatre during the presentations. I think we'll find a larger venue for next time. There were lots of interesting tales of local companies doing world beating things, but for me the most impressive thing was that most of the companies that came to see us had hired (and even brought along) ex-Hull graduates who now worked with them. This was a follow on from our Games event a few weeks ago. We'll be doing it all again in a year's time. If not sooner. Good qualifications are nice, but a great portfolio of things you have made is the thing that will really get you places. Particularly if it is packed with stuff you did "just to see what you could do" and shows off lots of different technologies. Networking is key, and Twitter is one of the best ways to make contacts. But don't forget to go out and meet people too. Game studios may come and go, but there is always a market for capable developers. And everybody that spoke was building their business, with the consequent need for new hirings in the future. You can find more details of the event and, if you are a Hull student sign up for the next one in February, here. Oh, and Adam really, really, wants you to sign up for Global GameJam this weekend. If you've ever wondered if it is possible to travel to from Hull to Mons in Belgium, do a session at Dev Day 15 and then fly back on the same day I'm able to tell you that it can be done. Even if the day starts with a 90 minute delay before you take off and you arrive too late to make your ongoing rail connection. Fortunately, because the people at Thalys are completely awesome, this was simply a matter of rebooking on a later train (at no extra cost) and then heading off. I got to the venue around 20 minutes before my session. You can't beat just in time delivery. I did my session, and then headed straight back for my train home, getting back just in time for bed. Thanks to Christophe for the picture. Thanks to Olivier and the crew for organising the whole thing. It's actually a rather inspiring story. A bunch of developers wanted a conference in their part of the world and they just built one. They've got lots of delegates, sponsorship, a great venue in a cinema multiplex and splendid Microsofties like Andy Wigley coming along to give them sessions on the latest tech. Great stuff. A pleasure to be involved with. I'll be there next year if you want me. I've started working on the slide deck for Dev Day 2015. Well, it is next Tuesday. I'm talking about my Snaps framework, what it does, why you'd want to use it and how it works. If you fancy coming along you can find out more here. On the 11th November I'm doing a session at Future Decoded in London. This will be all about my little programming framework called SNAPS. How I built it, what it does, and why it is such a wonderful companion to a Raspberry Pi running Windows 10. SNAPS is a big part of my forthcoming new programming text (I just have to write the first three books first - ho ho) and I'm really looking forward to showing it off. 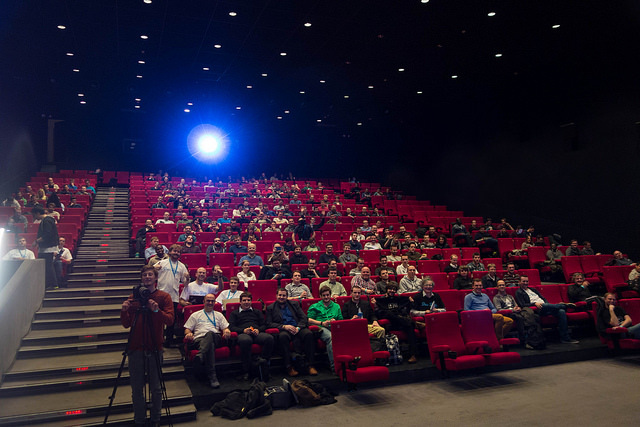 In December I'm heading over to Mons in Belgium to do a session at Dev Day 2015. Again the focus will be on SNAPS, but this time I'm going to take a peek under the hood and explain how you can use some SNAPS implementation magic to help make better Windows apps of your own. And there will be cheese. It's a promise. Spent a big chunk of today writing content for TechDays later this week. I'm giving two sessions. Rather looking forward to it. In this session we had some talks on different aspects of security. First up was a discussion of techniques to address "man in the middle" attacks, where a bad person interposes themselves between you and the person you are talking to. This technique of intercepting and relaying messages is particularly dangerous in a world where people are happy to use the nearest open WiFi connection with no thought of security. Then we moved on to a fascinating discussion of how we can remove the faces of "innocent bystanders" from photos that we take when we are out and about. This is a surprisingly tricky thing to do and led to a great discourse about how privacy can be managed in the wild. The next session I went to took a high level view of the development process, with the goal of working out how to make properly useful devices, both now and in the future. This is something that we are not terribly good at today, but with increasing levels of complexity and a greater range of uses than ever before, it is important that we make sure that the devices we surround ourselves with aren't more frustrating for us than they are worth. The talk was placed in the context of producing something really useful, a way of allowing blind people to navigate around cities on their own. The project uses bone-conduction headphones which relay navigation advice generated by a smartphone. The most impressive thing about this for me was the intent to build a system that works even when the user is doing something else. In other words the user would be able to carry on a conversation even while finding their way around. I wasn't quite sure what to expect from this session, but what we got was some very good discussion of the problems faced when you connect households to the internet. Things have moved on from the early internet where a home had one computer and one wire to the router. Nowadays there will be many devices connected via WiFi and a huge problem diagnosing what has broken when things fail. I saw the results of an interesting study looking for reasons why home networks fail (a hint: it's usually the WiFi connection) and some very interesting ideas about moving the home router into the cloud. During the lunch break they had demonstrations of some really neat stuff. I wandered around with my camera and took some pictures. This is a way of making 3D rapid prototype printing even more rapid. Rather than printing out a filled in model the printer produces a 3D outline. There are a number of technical challenges to address here. The printer needs a larger hole in the nozzle to print thicker strands, the output has to be carefully cooled as the models are built and the slicing software has to be re-written to drive the printer in a completely different way. Very clever. These are Picco devices. Tiny miniature screens that you can use to send playful, or useful messages to folks you know. Inside each tiny device is an .NET Microframework powered processor, a WiFi interface, SD card and display unit. The devices and their 3D printed cases were created to explore product development as much as invent new kinds of interaction. Very clever and great fun to play with. This picture shows some prototype "Disruptive Display" devices. These provide a completely new kind of display medium that "remembers" what light you shine onto it. By using light sensitive transistors in the construction of display drivers you can make a display which can be triggered to retain the level of light that is falling on it at a particular moment. The way I saw this, it meant you could make a wall display that you could "program" using a video projector whenever you felt like changing the scenery. The display doesn't really "remember" anything, each individual pixel retains their setting. You could also use this to "paint" with a torch, and then flick a switch and create a new picture. There were also folks showing off circuits you can draw, some amazing touch devices on flexible materials, devices that can create radio signals entirely in software, posters you can vote on and a networking system for servers that can reconfigure its topology dynamically to match the use case. You can find details of all the projects here. The final presentation of the day was from Victor Bahl, who talked about the way that the cloud is becoming part of the way our machines work. Heavy duty tasks such as face recognition reap a huge benefit from cloud computing. The results are obtained more quickly and place less of a load on the batteries in the mobile device. But of course to use the cloud your device must send the data to be analysed and then get the result back, which depends on fast data transfer. In many applications it is particularly important to get responses back quickly. Introducing a few milliseconds delay into the loop can make the difference between life and death for a video game player. Victor talked about the way performance can be improved by streamlining the protocols used to send requests and also how large monolithic data servers were not the complete answer to the problem. Instead he described how smaller numbers of servers, "cloudlets" are now being deployed. These provide high performance local resources and reduce network traffic. I wasn't able to stay to the end of this session because we had to grab a cab to the station. I had a tight schedule for the journey back. When I organised the tickets I thought that an interval of twenty five minutes would be plenty of time to get from the Eurotunnel train to the Hull one. Of course I was making the assumption that everything would run on time, which turned out to be mostly right. But it did mean for an exciting sprint across a tiny part of London. Thanks so much to Microsoft Research for Inviting me. It was a great event and it was lovely to catch up with some folks I've not seen in a while. Note: These are my recollections from my track through the proceedings and are a bit subjective - but of course completely right :). I hope you find them an interesting read. The summit proper started today. The first two Plenary sessions set an amazing standard to get us started. Very thought provoking, not just in the context of what people are doing, but also why the are doing it. And what can go wrong. The first of the sessions was from Peter Lee of Microsoft Research. He described how research and development work together, telling the story of a research group who devised a technology that used an array of 9 microphones to focus on a single speaker in a noisy environment. When they saw this the marketing department first asked for cheaper microphones, then for only four of them, and finally an ability to work with minimal calibration. The group duly delivered and their technology became part of the Kinect sensor, one of the fastest selling gadgets in history. And the punch line of the story was that the academic paper describing the techniques that were used was subsequently rejected by a journal as having limited practical application. Such is life. Research is hard work, and non-linear. Peter talked about another research area which is chancging the way we use computers, voice recognition. He described how for the first ten years of this century the rate of errors in recognition remained stubbornly at around 20%, despite the best efforts of researchers in the field. Then, suddenly in the last few years we've seen a massive improvement in performance down to an error rate of around 7%, to the point where conversational translation is now going mainstream. And the outcomes of research are not what you expect. One popular use for speech recognition/translation turns out not to be about talking a foreign language, but simply being able to see what people are saying if you are hard of hearing. Very interesting stuff, and a great context for the ongoing discussions about ideas and the application of them. Raffaello D’Andrea has done some really amazing things. From helping to design the next wave of robots to help Amazon to fulfil orders to making incredible juggling drones. He talked about how machines can be made to learn and adapt, and that it is probably not fair for us humans to make fun of clumsy robots. After all, it took several years for us to lean how to walk and move around with out breaking the furniture. The Kiva robots and the flying machines that Raffaello worked on are both built with an ability to learn by practice and then over their lifetime continuously adjust to changing as they wear. This makes for properly useful technology, building on the original feedback mechanisms used to keep steam engines running at constant speed under different loading conditions. Feedback is a trick where you take the output of something and use it as an input. In the case of the steam engine the idea is that the faster the engine runs, the less steam it gets, making it stabilise at a particular speed. Slow the engine down by making it work harder and more steam is injected to bring the speed back up. But the problem with feedback is that it can be fiddly. The wrong amount of feedback can produce a wildly oscillating system or no movement at all. And combining two stable, feedback controlled, systems does not always end well. Although - strangely - the converse is also true. Two unstable systems can be combined to create a single stable one. Raffaello said that he considered feedback to be a necessary evil, in that it made systems work, but should be used sparingly and with proper understanding of the potential for instability. He also voiced concern about the possibilities for problems when connecting large numbers of systems together. From a mathematical point of view it can be shown that this will lead to massive, unpredictable events every now and then. And considering that the Internet of Things is going to lead to a whole new connected world, this is something we need to think about. This was a fascinating and wide ranging session made up of presentations from a researchers in a number of different areas. There were talks about polymer batteries, printing electronic circuits on flexible materials, energy harvesting and even weaving electronics into material. Any session that contains the phrase "Infrared spectroscopy woven into socks" has got to be a good one. And it was. After lunch it was time for a session on rapid device prototyping. The starting point was TouchDevelop, a development environment that is a great place to write and share code. You can create TouchDevelop programs on any mobile device and share them all around the world. And now TouchDevelop has an embedded presence too. Your TouchDevelop code can be downloaded into an Engduino device. The Engduino is based on the Arduino platform, providing a whole bunch of sensors and coloured lights and software libraries to control them. There's emulation of the as part of the TouchDevelop framework, which makes it very easy to create programs, and they are working on simple network deployment of the compiled programs. If you're looking for a quick and easy way to start coding, TouchDevelop is a great place to start. You can start writing code on your phone on the bus, and then complete the program on your PC later in the day. The code is all stored in the cloud and is dead easy to share. And the Engduino is a great little hardware platform, with plenty of connections including leds, accelerometer, magnetometer, Bluetooth and an SD card. This was the final plenary keynote of the day. The focus of the talk was science, nature and power, with a great discussion of how solar cells work, how to make them better (and print them), and the fundamental science behind energy capture. There are some fundamental physical reasons which limit the amount of energy you can capture from sunlight, but this session gave a great description of how we can make solar cells which are better, cheaper and easier to make and deploy. Really fascinating stuff. We rounded off the day with dinner on a boat trip down the Seine which was lovely. 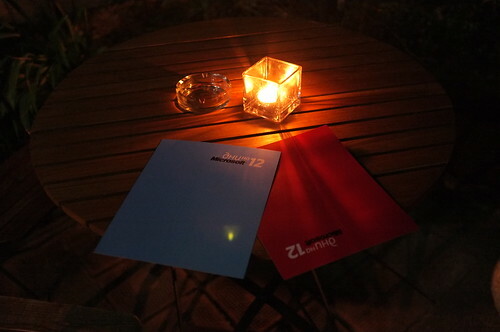 Great food, great company, great technology. What's not to love? Well, this is nice. I'm in Paris for the Microsoft Devices and Networking Summit 2015. A chance to look at some very interesting embedded stuff. In Paris. What's not to love. The hotel is just down the road from the Eiffel tower. So of course I headed over there. I love the Eiffel tower. Fantastic place. And great for photographs too. If you want to see full size versions of the pictures you can click through to the images on Flickr. The conference starts tomorrow. Can't wait. I'd love to have stayed longer, but it turns out that I'll be updating module descriptions for the rest of the evening. In Paris. Such is life. Gathering at the start. Nothing brings folks in like Free Food..
We held a Careers and Internships event last year. It went really well so we thought we'd do it again. So we did. And it went really well again. We had loads of companies show up and present, and then they manned stands and took business cards (that we had rather thoughtfully provided) from our students. One thing that surprised and pleased me was the number of companies in the area doing world beating stuff. And one company mentioned the awesome news that Hull was one of the top ten cities singled out in a recent Tech City UK report. You can find the report here. Skip to pages 45 and 46 for the good stuff. It was great to see the students and employers engaging again. 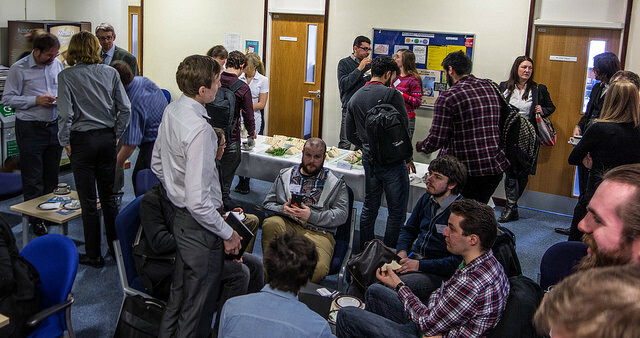 Many companies had brought Hull University graduates with them as part of their teams, and there was something of a reunion flavour to the event, which was really nice. And, of course, we'll run it again next year. If you're a Hull student, I wrote a little executive summary about the event. Send me an email and I'll let you have a copy. For the hardware one I've got flashing lights and all kinds of good stuff, and I'm really looking forward to telling folks about the wonders of MonoGame. And there will be special treats for the ones who turn up at the 7:45 am session to find out all about Phone to Phone communications. If you are coming along to the conference I'd love to see you. I've even written some new jokes.. 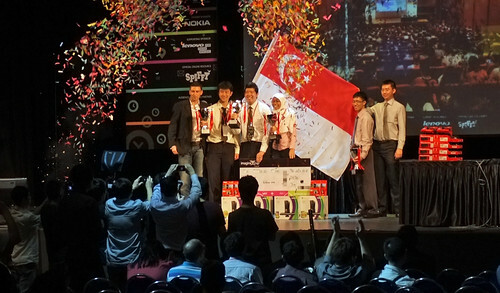 I was lucky enough to be invited to help judge the 2012 Singapore Imagine Cup Final presentations today. Yesterday a series of sessions had taken the teams down from 16 to 4 and today we had to pick the winner from these. For the teams in the room it must have been especially nerve wracking because the finalists were announced just before they had to present and had a scant 10 minutes to prepare for their session. Not that it showed. Every team delivered a very professional result which brought home to me just how much the standard has improved in the competition. All the presentations were what I would call “world standard”, in that they were the equal of ones I have seen at the World Final level. However, there was a standout winner and so congratulations to Eustace Zheng Xiangwen, Nur Nadiah Binte Zailani, Koh Kai Wei and Mong Xunheng (hope I got your names right) who made up Team AlphaWaves. Their system, the Dementia Assistance and Recall Engine (DARE) provides support to sufferers of one of the nastiest things that can happen to a person. I wish them the best of luck in the world finals in Australia later this year. If you want to find out more about the competition and get some tips about preparation for the next rounds I’ll be hosting a Live Meeting on Wednesday 18th of April at 16:30 GMT. You can sign up here for the meeting. 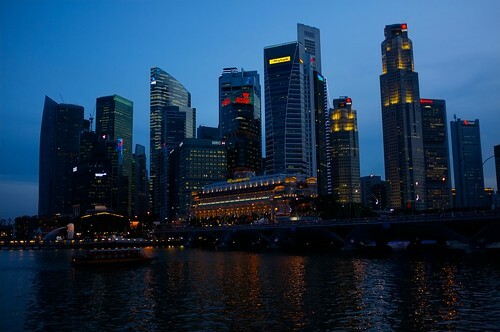 After the finals I had a quick look around Singapore and then we headed off for a really posh meal. Thanks for inviting me folks, it has been great. My only regret is that I’m in town for such a short time. I think that is everything, if you remember something I forgot, let me know and I’ll add it. Once the presentations were over I went for a wander round the city. After some fun and games on the transit I managed to get all the way down to the bay. I took loads of pictures which I’ll play with properly when I get home. In the meantime here are just a couple. A boat on a building? And why not. I’ve just got back from Bulgaria and already I’m preparing for the next trip away. The week after next I’ll be heading for Singapore to give some sessions (and be part of the keynote) at Microsoft Campfire. I’ve had a look at the agenda and it looks really interesting. I’ll be doing some Windows Phone and some Kinect stuff (let’s see if we can lay ‘The Curse of the Kinect’ to rest once and for all) and there’s some Imagine Cup action too. Should be great fun. If you are in the area you can sign up here. Flew back from Sofia today, everything was fine including the 7 hour stay at Schipol airport. The McDonalds there was serving “1955” burgers which are ace.